Almost every industry is subject to some sort of government regulation. That doesn't preclude the idea of private industry. Regulation means that the government controls it. The government controls space. Your idea of private space industry is just that, an idea. An idea that the government controls. Hence your argument loops back around to an appeal to the integrity of the government. When you say "private space companies" we must add "who are instructed by government" to that sentence. All of which are based upon Globe projections. So it doesn't get someone out of the jam of not using Google maps just because it has a globe view and these layouts don't. There are accurate maps of the earth used and accepted by tens or hundreds of millions of of people every single day in which the map of the earth is represented as a FLAT plane. Represented on a flat surface with a grid that identifies the shape of a round earth using latitude and longitude. This will help make a map. 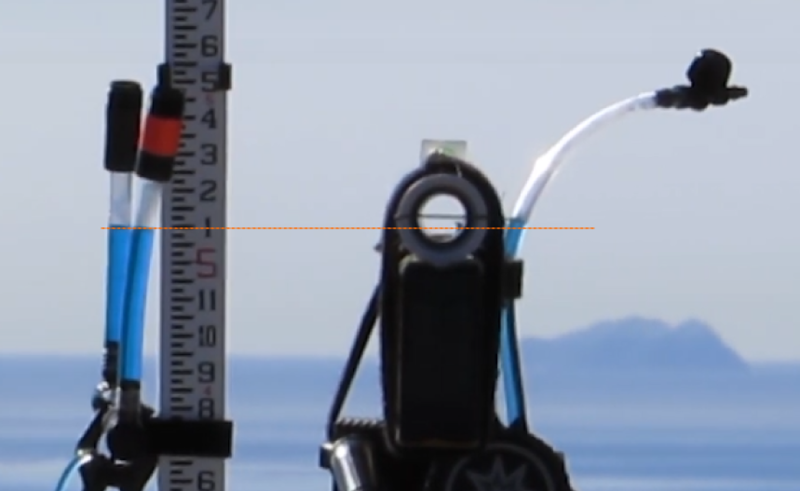 Flat Earth Investigations / Re: What's the best tool for measuring eye level? In the case of the above device, it is questionable whether the front container is even level. There is a lip of lightness at the top, like we are looking down at it. In the case of the colored water, the upper surface might be entirely black, missing cues like this. The thick meniscus in these devices cause the same issues as the colored water does. Questionable calibration and alignment. Steps to ensure accuracy are desired. You have ignored details of a device with specified accuuracy and calibation that I provided. Why? Samuel Birley Rowbotham studied that very topic in his work Earth Not a Globe. Take a look at his eye level and horizon experiments in Chapter 2, as well as his theodolite experiments. Interesting that you choose to ignore details of professional surveying equipment. A second set of experiments in a "hidden box" may be helpful, in the case that the experiment always gives random results. But what if they always give the same wrong or high results? "A scientific control is an experiment or observation designed to minimize the effects of variables other than the independent variable." It seems difficult doubt that the third container in the three container version of this experiment serves the purpose of the above -- to minimize the effects of variables which may affect the device and act as testament to the underlying hypothesis. Maybe the curved meniscus always makes the level seem too high. Perhaps the water isn't really level in such devices. It could be that the refraction from going between air and water always affects the results. In any case, the experiment should be calibrated and controlled for validity. You could use something like a Leica NA332 which has 1.8mm standard deviation over 1km and comes with a calibration certificate. Doesn't look lined up to me. It appears to be another piece of evidence that these devices are unable to be calibrated. The accuracy is well within that needed to show the horizon is below the level of the instrument. Do you have an alternative design? Flat Earth Community / Re: Why just Rowbotham? Rowbotham's work on the topic is still much more detailed and systematic than any other studies so far. More than the work of cartographic organisations across the earth? We can measure our location to within a few cm. The WGS-84 model is understood and accepted throughout the scientific community. We have universally accepted definitions of the constants of mass etc. The second post in the thread has the bipolar model. The OP has asked for contributing content only. I suppose that the constant speed may also be explained by the Electromagnetic Accelerator. Oh, so you don’t actually know the speed, but rather assume the number shown to you is accurate. Use the GPS on your phone, hold it by a window to show speed and location. It might even tell you the distance from New York to Paris. Flat Earth Theory / Re: How can FE make a map? I clicked on the first link and it gave me a search on "map", not sure what that means. I clicked on the second link, got a map. On this map, Australia (continent, area = 7,692,024 km2 ) is smaller than Greenland (island, area = 2,166,086 km2). This map does not work. Can you give me a link to a flat map that has Greenland, USA, and Australia in proper size relationships? There is no such link, this can only be done on a globe. I will find the problem on any flat map of the whole world. Link to flat map with Australia, USA and Greenland at proper size, pleeeeease. I would also like you to note that these are big name websites used by millions of people each day to travel. All based on the WGS-84 model of the round earth. Flat Earth Investigations / Re: Non-believer. Open-minded. Just need help to understand. This is such a convoluted explanation when the one we have - that the moon is lit by the sun - already matches observations. There is no need to ask here, look it up on the internet. I think it is relevant to consider our position. REers constantly mock FEers, and so it is natural to take a defensive or apprehensive stance. Hopefully, I might be able to assist you in your questions. ON the topics of distances, there is a huge concern. Monopole FE models predict much vaster distances around the edges of the plane (southern hemisphere on globe) than what is claimed in a RE model. The reason this is an issue is that such distortions would not be limited to the scientific arena, and all sailors and pilots who traveled in the southern hemispheres should notice that their RE maps are simply wrong. They can't ALL be in on the conspiracy, and so we arrive at an impasse. Model the trajectories of the Sun across the sky from different locations on Earth. Since FEers are everywhere, we should be able to join together to aggregate resources. With these trajectories, and knowing the locations from which they were measured, accurate zetetic mapping can be deduced to identify proper distances. This reverse-engineering approach by-passes the impasse of the distance debate, and instead only uses the assumptions that the Earth is a plane and the Sun maintains an approximate constant distance away as it travels. The angle of the sun at a particular location and time is available online. It would be interesting to take a significant number from widely spaced locations and from them determine the distances as there is no doubt about the accuracy of the information. I have a slight suspicion it may show a round earth, you may find otherwise. Lackey, do you actually have any evidence to back up your opinions. Just denying or declaring fake everything which doesn't conform with your world view is not a sensible way to think or debate. Oh, you fail to consider MH370 as evidence? What do you think it's evidence of? The most likely story is it crashed into the ocean and was never found. As the black box was never recovered it's impossible to be sure what occurred. I'm not clear what you think this is a smoking gun of and how it in any way refutes the fact that flights between, say, Santiago and Australian cities exist and are used by hundreds of people a week. You'd think if those flights were advertised and took twice as long as advertised you'd have heard about it. MH370 was going from Kuala Lumpur to Beijing, both in the northern hemisphere, so what do you think it shows? I see you have now made another post baselessly claiming that the flights don't exist because there wouldn't be enough demand. What is your basis for that claim? As usual, you fail to understand that GPS and flight tracking for flights close to or in the so-called Southern Hemisphere do not exist. MH370 is pretty solid evidence for this reality. Again, any joe blow can claim hundreds of people use these flights. If they even do fly between Australia and South Africa, more than likely most of these non-stop flights are cancelled at the last minute and persons are diverted to one-stop or two-stop layovers. Recent outlandish flight speeds have been posted for long distance flights, proving planes can also fly faster than advertised. flightradar24 shows flights across Australia. It doesn't matter if the author used an excuse to try and explain it. Of course they are going to try to explain experiments that contradict their science. The quote shows from a traditional source that the problem is acknowledged. Light is changing velocity in the Sagnac Experiment and other experiments, and that is a problem that needs to be fixed. Flat Earth is a better model because it doesn't need most of these illusions. "Things shrink when they move and it's only an illusion that the earth seems still when light moves horizontally" is unneeded. It's not just relativity. It is many other things as well. Flat Earth Theory, and Zeteticism, is a movement of emperical inquiry. We are empericists. We did look into the Ring Laser Gyroscope Experiment, and we found no direct or emperical evidence that it was actually detecting motion beneath it. There is an article in the General Physics section of the Wiki. In our movement we value demonstration and are generally dismissive of those who make claims without reference to demonstration or the emperical evidence to back up those claims. We have higher standards for science than most people. Do you have a view on the WGS-84 model that our maps are based on? Flat Earth Theory / Re: Electromagnetics Spectrum on a Flat Earth Model - How & Why? It's well established that during the equinoxes on a globe Earth, the sun will rise due east or 90 degrees azimuth when observed from any point on the Earth (give or take ~10 degrees due to refraction). What is the expected azimuth for the sun to rise when viewed from a given point on a flat Earth and what is the explanation for this? My guess at the moment is that the azimuth of the sun should decrease non-linearly when measured from north as the observer's latitude decreases, but I'd like some input from a flat Earther. Finally, we can easily investigate this by observing the sun during the coming equinox on the 20th March and compare these to the two models above. Any thoughts? Beat frequency is the number of beats per second. A beat frequency of 287.75 Hz is meaningless. Hz already means instances per second. "According to their formula"? Are you kidding. You need to prove that formula. Appealing to something that was made after the fact, after device was created, and the results were analyzed, is invalid, and stupid. Especially something that requires the input of the number of seconds in a day. Do you ever contact the authors of research you disagree with? More productive than discussions with random people here.